Saudi Arabia is excavating a new archeological site that will show horses were domesticated 9,000 years ago in the Arabian peninsula, the country’s antiquities expert said Wednesday. The conventional wisdom is that horses were domesticated 5,500 years ago in Central Asia. We’ve been getting into the weekend Bangor Daily News lately (especially since the Press Herald is pretty redneck, racist and Republican). Luckily it’s a great paper, having recently hired a former New England Journalist of the Year as well as a Pulitzer Prize-winning photographer to cover the Portland area. I’m all for that! 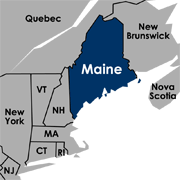 This weekend they had an interesting story about St. Croix Island, in the St. Croix river between Maine and New Brunswick, that was settled by the French in 1604 – three years before Popham Colony and Jamestown Settlement. Check out, “An island prison: Rugged St. Croix Island brought ghastly death to early settlers“. Last night I was admitted into Boston University’s Online Master of Science in Health Communication program! I’m going back to BU, baby! Despite the hours of preparation put into the often vast displays of food, waiters at top hotels in Dubai say much of the food left over goes straight into the waste bins. The amount of food thrown out in the emirate jumps considerably in the holy month – by as much as 20 percent according to Dubai Municipality, with most of the waste comprising rice and non-vegetable foods. Around 1,850 tons of food were thrown out on average per day during Ramadan in 2010, roughly 20 percent of total waste in the emirate during the holy month, it said. I’d be remiss if I didn’t mention this – the first website went live just over 20 years ago (August 6, 1991 to be exact). info.cern.ch was the address of the world’s first world wide web page and server. (.ch is the internet country code for Switzerland, where CERN is). As for me personally, I downloaded Netscape Navigator in late 1994 or early 1995 during my freshman year at Boston University. I was the first person on my floor to have an internet browser. Of course, finding web pages was difficult back then, pre-Yahoo and Google … but we made due. Ugh. I feel that I can smell this from here, “Trouble in paradise as plumbing problems hit Dubai’s Palm island“. Did something happen at Disneyland Resort Paris’ Hotel Cheyenne this week? Like, on August 8? See, I have a Flickr photo sharing page. That’s where I have photos from Dubai, photos from some trips (without people), assorted artsy shots of Portland. My 950 photos generally get 100-200 views on a given day. So either 200 viewers came to look at one photo, or 100 people came to my gallery and looked at two photos each. Generally it’s more like 8-12 views of certain photos each day. Oftentimes people end up on my photos after Googled searching for a term that’s one of my keywords – such as “Burj Khalifa”. Speaking of the Burj, one of my photos of the world’s tallest building had the most views in my gallery, about 11,200 or so as of this week. That makes sense, it’s newsworthy, it’s cool looking, and it’s a nice photo. 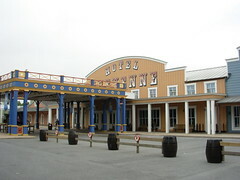 My second-most viewed photo was Dubai’s Ibn Battuta Mall, third was Ski Dubai, and so on, but following in the top ten were a few shots of Disneyland Resort Paris – I guess my photos show up when you Google the resort. 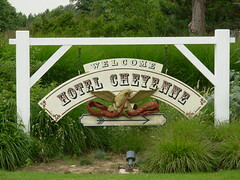 In fact, on August 8 nine of my ten most viewed photos were of Hotel Cheyenne. I had 7,493 views in one day. It looks like they mostly came from Google, too. I scoured the news and didn’t find anything (yet) but this is just odd. Something had to have happened there … why would everyone be Googling it at once? This is a pretty interesting read. I love putting current events into historical context. While the details of the debt ceiling deal remain fuzzy, this much is clear: Barack Obama may be president, but the Tea Party is now running Washington. How did this happen? Simple; this is what American politics looks like when there’s no left-wing movement and no war. Let’s start with the first point. Liberals are furious that President Obama agreed to massive spending cuts, and the promise of more, without any increase in revenues. They should be: Given how much the Bush tax cuts have contributed to the deficit (and how little they’ve spurred economic growth), it’s mind-boggling that they’ve apparently escaped this deficit-reduction deal unscathed. But there’s a reason for that: since the economy collapsed in 2008, only one grassroots movement has emerged in response, and it’s been a movement of the right. Compare that with what happened during the Depression. In 1933, Franklin Roosevelt assumed the presidency and launched the hodgepodge of domestic programs that historians call the first New Deal. By 1935, however, he was looking warily over his left shoulder at Huey Long, whose “Share our Wealth” movement demanded that incomes be capped at $1 million and every family be guaranteed an income no less than one-third the national average. At the same time, the Townsend plan to guarantee generous pensions to every elderly American had organizers in every state in the union. To be sure, FDR had vehement opponents on his right, but he was at least as concerned about the populist left, which helps explain why he enacted the more ambitious “second new deal,” which included Social Security, the massive public jobs program called the Works Progress Administration and the Wagner Act, which for the first time in American history put Washington on the side of labor unions. Obama, like FDR, had a reasonably successful first two years: a stimulus package that while too small for the circumstances was still large by historical standards and a health care bill that while subpar in myriad ways still far exceeded the efforts of other recent Democratic presidents. And then, unlike FDR, he ran into a grassroots movement of the right. Historians will long debate why the financial collapse of 2008 produced a right-wing populist movement and not a left-wing one. Perhaps it’s because Obama didn’t take on Wall Street, perhaps it’s because with labor unions so weak there’s just not the organizational muscle to create such a movement, perhaps it’s because trust in government is so low that pro-government populism is almost impossible. Whatever the reason, it was the emergence of the Tea Party as the most powerful grassroots pressure group in America that laid the groundwork for Sunday night’s deal. The fact that polling showed Obama getting the better of the debt ceiling debate barely mattered. The 2010 elections brought to Congress a group of Republicans theologically committed to cutting government. And they have proved more committed, or perhaps just more reckless, than anyone else in Washington. But it’s not just the absence of a mass left-wing movement that explains last night’s deal. It’s the end of the war on terror. From 9/11 until George W. Bush left office, the “war on terror” defined the Republican Party. That meant massive increases in defense and homeland security spending, but it also meant increases in domestic spending—such as the 2004 prescription drug bill—aimed at ensuring that Bush got reelected, so he could perpetuate the war on terror. In that way, “war on terror” politics resembled cold war politics, in which the right’s desire for guns and the left’s desire for butter usually combined to ensure that all forms of government spending went up. The Tea Party, by contrast, is a post-war on terror phenomenon. Many of the newly-elected Republicans are indifferent, if not hostile, to the wars in Afghanistan and Iraq. They’re happy to cut the defense budget, especially since cutting the defense budget makes it easier to persuade Democrats to swallow larger cuts in domestic spending. It’s the reverse of the cold war dynamic. During the cold war—especially in the Nixon and Reagan years–conservatives accepted that overall spending would go up in order to ensure that some that increase went to defense. Today, conservatives accept defense cuts in order to ensure that overall spending goes down. The good news is that the Tea Party, more than Barack Obama, has now ended the neoconservative dream of an ever-expanding American empire. The bad news is that it has also ended whatever hopes liberals once entertained that roughly 100 years after Theodore Roosevelt and Woodrow Wilson, roughly 75 years after the New Deal and roughly 50 years after the Great Society, we were living in another great age of progressive reform. Given the era of fiscal scarcity we’re now entering, those neocon and progressive dreams are now likely dead for many years to come. Meanwhile, the Tea Party’s dream of a government reduced to its pre-welfare state size becomes ever real.